Our powerful landing page builder is within your site, where you can create lead generation pages (or “squeeze pages” as many people call them) in a matter of minutes. Landing Pages are amazing resources and are meant to be used as a funnel and not as the main page for your website. Why? These pages shouldn’t have any links to go to other pages and take someone away from the page. The landing page should have one option – to opt-in as a lead. You’ll find a couple landing pages on your site as a part of your site’s template. The pages will have something of value to offer, such as a PDF or a report. Our research shows you receive the most leads from a landing page if you offer something for free. Folks want to receive as much as they can for free before they buy into your service. Learn more about how you can set up landing pages below. Option A* Update the title of the page so you can find it easily. This helps with ranking as well. Adding one keyword is a bonus. Option C* Edit and add content and images to the landing page. Option E* These are the default recommended positions. Form position should be on the right or below the content. Header “hide” means the site’s logo, phone number, and top menu are not visible. Simple is the logo and phone number Full is everything shows. Content “hide” would mean the main content (as seen in Option C) is not visible. We always recommend having this visible. Footer “hide” means the site’s footer and footer menu are not visible. Simple is the equal housing and disclaimer show. Full, everything shows. 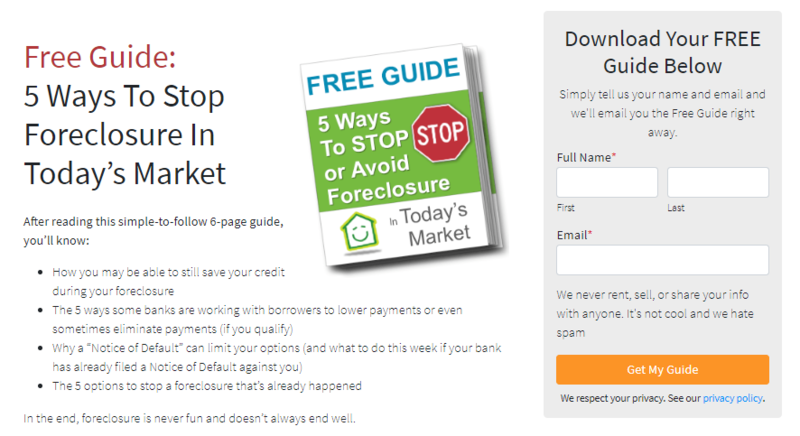 The following is our default landing page for the foreclosure guide. Footer and header are hidden. There’s no scrolling (unless you’re on a mobile device). It’s simple and straightforward. The following is a bit more involved for the end user. You will always scroll because the header is simple, footer is full, and the form is below the content. This means the page scrolls a lot more than other pages. The background is a single color with the main brand color being used to stand out. We sure hope those help provide some ideas on how you can use the landing pages and format them. Please reach out to our team if you have any questions.